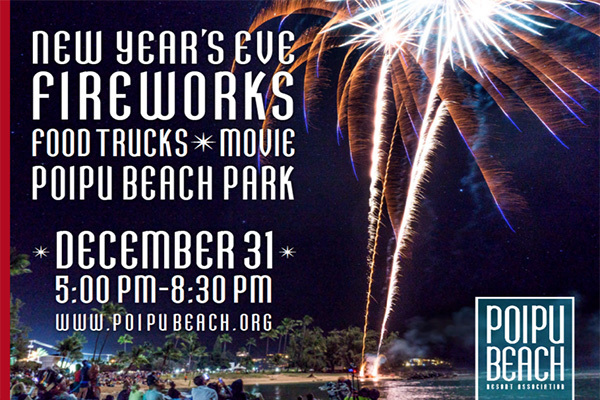 Grab your lawn chairs and blankets and join us for the annual New Year’s Eve Fireworks Celebration at Poipu Beach Park. We will be showing a FREE family-friendly movie, (TBA), on the big outdoor screen followed by a spectacular fireworks show. Food trucks will be lined up to keep bellies happy. The Celebration will take place on Monday, December 31st from 5 pm-8:30 pm. Fireworks will be launched at approximately 8:15pm.